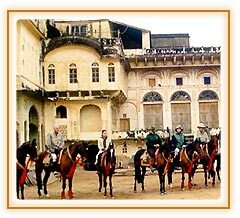 The forts and palaces tour of Rajasthan takes you on a royal journey. The packages offer the best of the destinations in the Indian royal state of Rajasthan like Mandawa, Bikaner, Khimsar, and Jaisalmer. Live life king-size and relish your holiday in the famous forts and palaces of Rajasthan. Besides being a royal holiday the forts and palaces tour package promises to offer you the time of your life reliving the colorful cultural heritage of India's famous tourist destination of Rajasthan. Meander down the centuries, enjoy camel safaris, cultural programs, dine and dance in the sand dunes, and collect souvenirs for your near and dear ones. 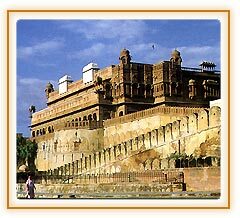 After b/fast, leave for Bikaner, a heavily fortified fort city famous for its camel farm and colorful people. Afternoon, visit fort & the local Camel Breeding Farm. O/N at the hotel. After b/fast, leave for Khimsar enroute visit Nagaur, a desert town noted for its fine fort and then visit the Royal castle at Khimsar. Evening, drive into the desert to see the sunset and to spot Antelopes, Peacocks and Deer & O/N at the hotel. After b/fast, continue via the Hindu Jain Temples at Osiyan to the ancient city of Jaisalmer city is one of India's most beautiful, colorful & fascinating place. O/N at hotel. After b/fast, city tour visiting temples, fort. Afternoon, drive outside the city to see Amar Sagar lake and to Sunset Point for a superb view of the city. O/N at the hotel. After b/f drive to Jodhpur with its massive 15th century fort in the most spectacular of cliff top settings. In the afternoon, exlpore the Bus y streets and bazaars. O/N at the hotel. After b/fast, visit the magnificent Meherangarh fort. Afternoon, go out to a Bishnoi village, where you will meet coloful tribal people and witness their village life. O/N at hotel. After b/f, a scenic drive south through the countryside to see the beautiful jain temples at Ranakpur. 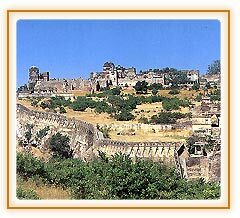 Continue on through villages to the fort at Kumbalgarh. O/N at the the hotel. After b/f, continue to Udaipur, visiting enroute the temples at Eklingji and Nagda. Arrive later in the afternoon at the unique lake city of Udaipur. O/N at hotel. After b/f, city tour visiting Palaces and Museum dedicated to Rajasthani arts, crafts and traditions. Afternoon at leisure. O/N at hotel. After b/f, drive via Chittorgarh to the small village of Junia. This interesting village offers an excellent insight into the life of rural india and its people. O/N at hotel. After b/f, drive to the colorful city Jaipur. On arrival check in to hotel. O/N at hotel. After b/f full day sightseeing of Jaipur city visiting various Palaces & Museum. O/N at hotel.